It’s hard to believe that more than six months have passed since I first posted on this blog. The realization of this milestone has really caused me to reflect on many aspects of the process. The first thing that comes to mind is the gratitude I feel to those who have followed my journey, encouraged me, provided feedback and ideas, and contributed to the conversation on various posts. There are also a number of other areas that give me cause for thought. The creative process and the act of forming words into a story has given me great joy. In my own journey into more essential living I have learned that the need to express and create are strong in us when we live as our essential selves, and this blog has allowed me those outlets. I have really loved combining photos into the posts. photography is something I’ve always enjoyed, and the opportunity to use of that art form has been gratifying. So has creating graphics as I have done for this post. Each post I write causes me to think about what I truly believe, and as a consequence who I want to be as a leader. I know many of you personally so “talking the talk” isn’t good enough. There has to be an intention to act as well. In my essential journey towards a more authentic way of living and leading, it was eye-opening to me to gain an understanding of the power of vulnerability. Writing publicly each week has put that concept into action for me, and I’ve found that it has helped me develop even further in this direction. The most important thoughts running through my mind are about the true nature of leading essentially. I have been considering the question: is essential leadership is more about the way we lead ourselves vs. the way we lead others? Perhaps this is a bit of a chicken and egg question. On one hand it is possible to learn and to act upon the principles of essential leadership without actually living the principles oneself. However to do so would be paradoxical, as our behaviours would be so obviously out of alignment with our guidance to others. Without the ability to manage our own reactions, listen openly with all our senses, ask ourselves essential questions about our role in a situation, to simply be totally present at each moment any attempt on our part to ask others to engage in this manner would not be taken seriously. On the other hand to lead ourselves essentially would mean continuous presence and self alignment, connection with others, a focus on our true passions, and a strong desire to contribute to the well-being of our community/organization. If we stopped there are we actually leading others by example as well? Or is it necessary that we act in a formal leadership capacity utilizing the meme of essential leadership for us to be considered to be considered to truly be leading in this fashion? Will others actually embrace the patterns of living essentially simply witnessing them in action? Or is some coaching, mentoring or other form of encouragement a necessary part of moving us along a new path of aligning our passions with our work? It is not possible to lead essentially without living essentially. By living essentially we actually do, in some way, lead others towards living more essentially. In order to shift the leadership culture of a group, it is necessary to consciously employ the principles of essential leadership on a day-to-day basis. 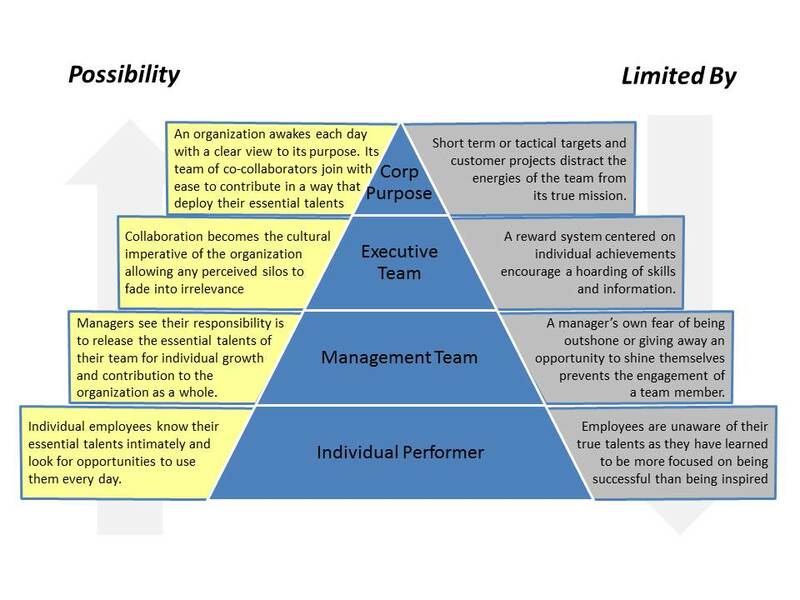 Essential leadership can be applied at many levels from individual leader, to business unit to organizations. In order to have the greatest impact, the model should be adopted at the highest level possible. Living essentially is a journey, not a destination, and so is leading essentially. What are your thoughts on this topic? Which is more important for a leader? To live essentially or to lead essentially? Would a broad adoption of an Essential Leadership model positively or negatively impact the effectiveness of an organization? I guess for me, I believe that living must precede the leading and yet even as I type these words I realize the demarcation is thin. If I’m living essentially, I am by example leading essentially though I may not have overtly or conciously incorporated it into my leadership style. Congruence is a powerful element in healthy living and ultimately I believe people are indivisible. How does the saying go? Watch your words they become your thoughts. Watch your thoughts they become your actions. Watch your actions they become your destiny. Thank you for reminding me that leadership starts with self. I think to lead others essentially you have to live essentially (lead yourself). They go hand in hand, don’t they. One would be able to pull it off for a time without living what they are preaching but eventually they’d slip up. Having towed the company line once or twice when I didn’t agree with it has proven this to me and it came off as unauthentic and phony to my team. It’s a very uncomfortable place to be… a place I don’t intend to be again. I really like your pyramid diagram Ian! Thanks for the feedback Diana! The pyramid has been hiding on my “About” page since the beginning, and was really my motivation to start this blog! I also like your question. I agree with you that one cannot lead essentially without living that way. As I posed to Andrew the flip side of that intrigues me … Is living essential a form of leadership on its own or do we have to deliberately add leadership to our actions to do that effectively? Totally agree. And then does it follow that if one leads by example and has a position of seniority and authority that there is the opportunity for magic? absolutely! to serve under that type of leadership is inspirational, invigorating, life-giving! I think that you need to live essentially first and in that regard LEAD yourself (which is sometimes hard to do) before you can lead others. In other words, sometimes all the theory which is in your head is great, but to actually act upon takes a great master. From what I have read, you are one of those masters and i have learned a lot from your posts these past six months, and they helped me in both my personal and business life. I like your pyramid and have seen it before (in your about page perhaps). However, I LOVE your ‘essential living’ circle even better. I thought to myself YES! I can do that! You and I have spoken about ‘needs’ before and they are sometimes depicted in a pyramid fashion. These pyramids seem like a mountain to climb when you are at the bottom! However, the circle design of being able to start at any point and move around to wherever you want (or need) to be seems as easier life plan that anyone can master. 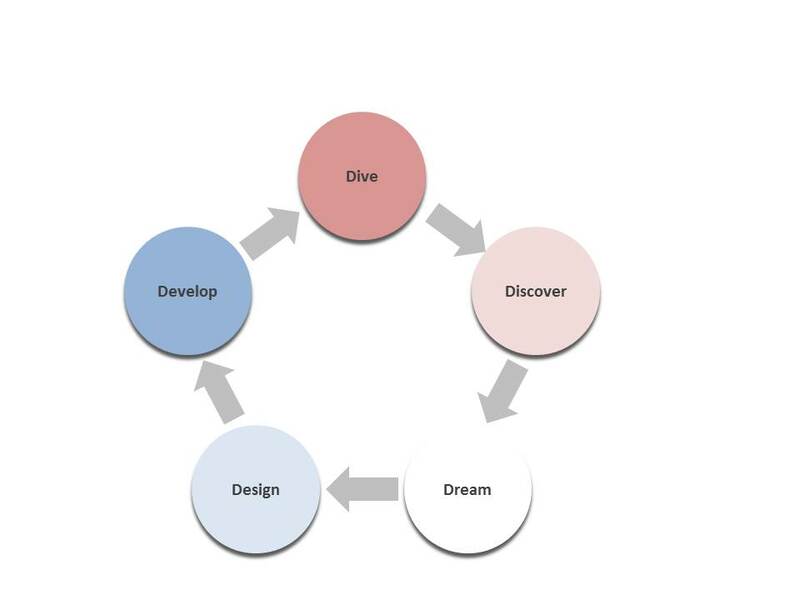 So you can begin with the dream and end up with the development or you can begin with a design and end up with a dream. Wherever you are, you can progress. I like it. I like it. Thanks. Thank you for your comments and thanks also for your support and feedback. Regarding the diagrams I appreciate your thoughts here. The pyramid can be daunting, and sometimes the pinnacle us difficult to reach. This is probably one of those! The circle does seem more attainable! I’m just working with this model now and exploring its potential. Our friend Louise has pointed out that it may in fact be a spiral… every lap a round takes you to a higher level! I like that!! I’m going to try to work it in! !